It is a rare sunny day in Yorkshire with blue skies which is lovely. I am in a very happy mood as well as I have been sorting out the last few details for our holiday to Oslo for Christmas 🙂 Very excited as we haven’t been away at Christmas for a few years and it will be very festive with snow and everything! I have been a very busy bee over the weekend finishing some more Christmas ornaments and a little treat for my craft room, all of them featuring bird designs from the lovely Jenny of Elefantz. Am currently in progress with another version of this beautiful one as well in the smaller version. 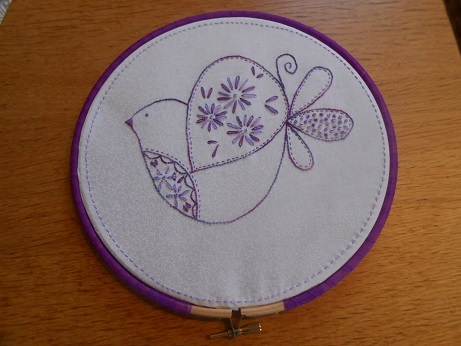 This is the Button Bird design, adapted as you can clearly see that there is no button! 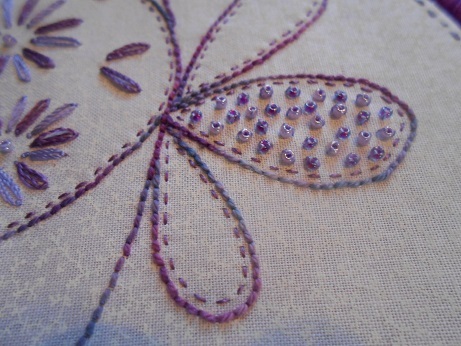 I decided to do more of the lovely lazy daisy stitches instead now I have got the hang of them and also added beads to the tail. I was wondering how to frame it and then remembered that I had an old embroidery hoop that had lost its ability to tighten properly so wrapped that in matching ribbon and ta da. 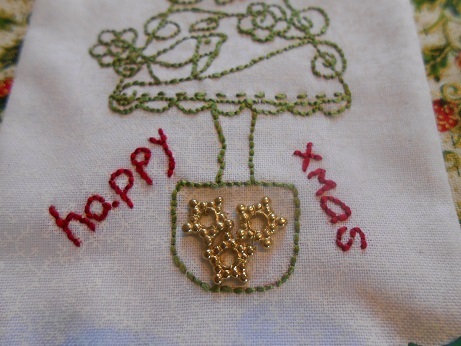 I think it looks lovely and will be the first of Jenny’s projects to get put up in the craft room.The hanging with the three embroideries that I blogged about previously is still a WIP as I plan to paper piece a border for it. 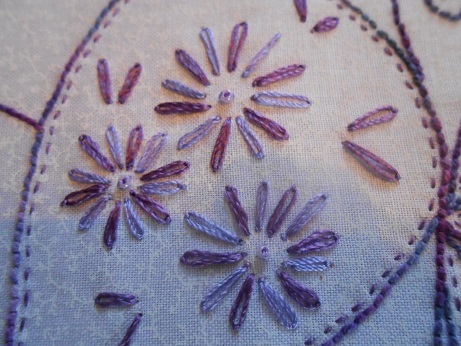 The threads are a combination of the variegated Perle thread that I bought at Harrogate and some of my Silk Mill purples and I think they look great together. 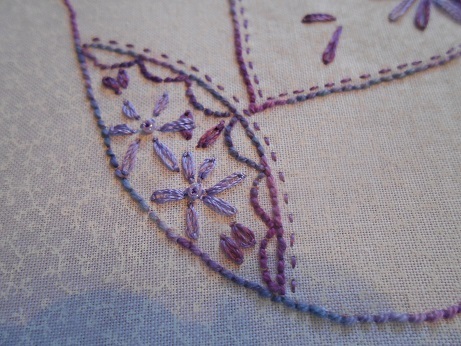 The next project is from one of Jenny’s previous Stitchery Clubs and is one that I have sewn before but this time decided to applique the wing which gave me a chance to practise buttonhole stitch. This is the Makower fabric that I bought from my local haberdashers a while ago and I thought a little pillow finish would be something different to do. This is one of a pair of special gifts for relatives. 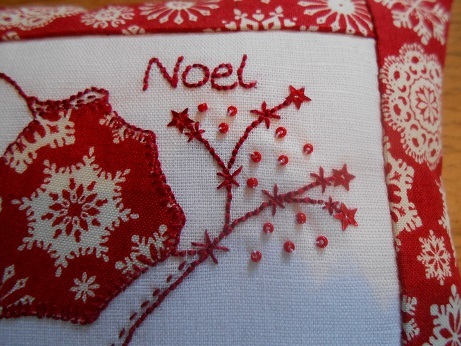 This last one is also from the last Stitchery Club set and is part of the bunting, I still have plans to make the whole of the bunting, but realistically that will have to be an after Christmas project, so this is just a little adaptation as a hanging. Have the rest of the other bird to work on this evening with the end of a very exciting boxed set, have been watching Wayward Pines and it has been very good. Hope you are all having a good week so far and have something nice to snuggle up with on these cold nights. Take care and thanks for visiting and don’t forget to like my giveaway post, I will be drawing names for that on at that weekend. The last of the flock, for now….. Thank you Linda, I love how fast these stitch up and they are great for in front of the TV, no dropped stitches ! 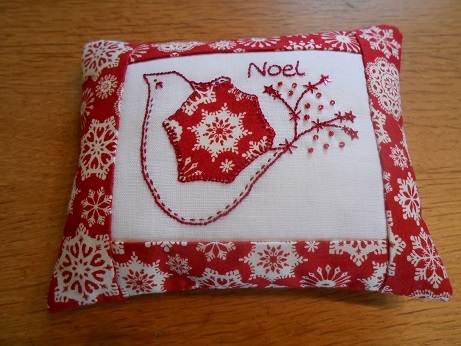 I bought a clip on light at Harrogate, so I may soon be able to stitch through the winter nights too! That sounds like a good idea, I need a daylight bulb for my lamp. 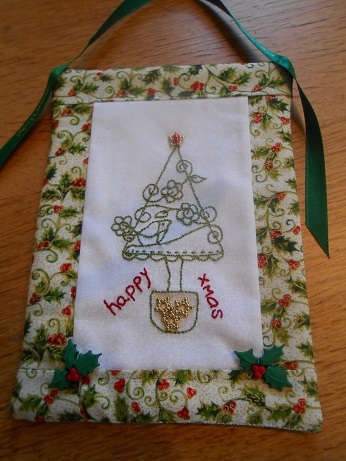 Thanks Jenny, as you can tell I am loving all of your designs, got lots more planned for presents to make after Christmas.